A recent coronial inquest prompted Transport Safety Victoria to review the risks to safety for boating in the vicinity of Port Phillip Heads. Recognising the various navigational hazards in the area, TSV sought an expansion to the area defined as Port Phillip Heads within the meaning of the Marine Safety Regulations 2012. Port Phillip Heads means all the waters between an imaginary line drawn between Shortland Bluff and Point Nepean, and the seaward limits of an imaginary line consisting the arc of a circle with a radius of 3 nautical miles centred on Point Lonsdale. This definition of Port Phillip Heads now includes the area at the entrance to Port Phillip Bay, where conditions are known to present additional risks to vessels operating there. 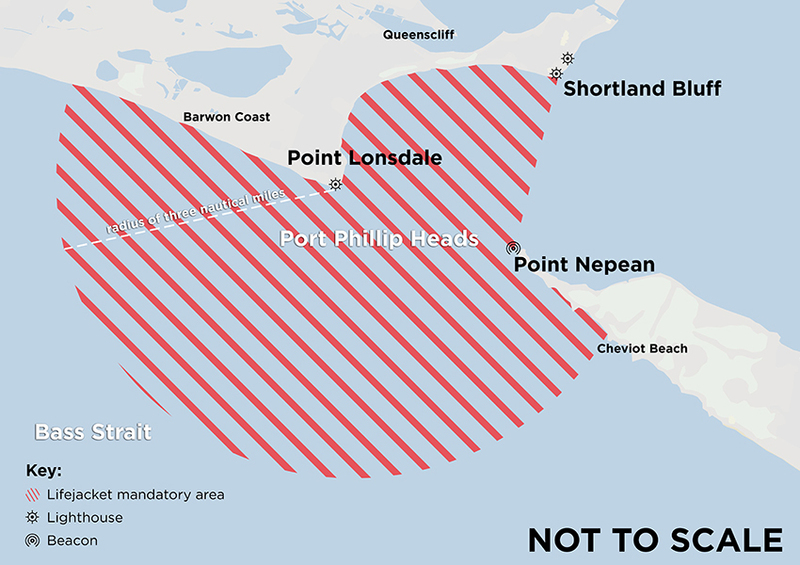 Port Phillip Heads is a "designated hazardous area" as defined in the regulation 101 4(a): the vessel is crossing or attempting to cross an ocean bar or operating within a designated hazardous area. Additional safety measures are imposed on vessels in designated hazardous areas, including mandatory PFD wearing.